You know you’ve made it when artists and companies start to invite you to review their products on your blog. Before all PR departments start sending me their latest high-end gadgets worth hundreds of pounds, invitations to Michelin-starred restaurants or exclusive hotels, it’s good to know that I don’t accept all random requests but tend to focus on what fits my personal interests. * When Logitech recently invited me to test their new iPad accessories during an East London street art tour with free breakfast AND lunch in the immensely popular Hoxton Hotel, I obviously immediately confirmed my attendance! A motley crew of lifestyle, fashion, food and photography bloggers assembled on a crisp December morning in the homely meeting room at the Hoxton Hotel where professional Instagrammer (yes, this is an actual job!) Kate Forster gave us an Instagram workhop while we all fuelled up on fresh croissants before setting off in Shoreditch, each with a borrowed iPad Air 2 and matching Logitech AnyAngle iPad case at hand. 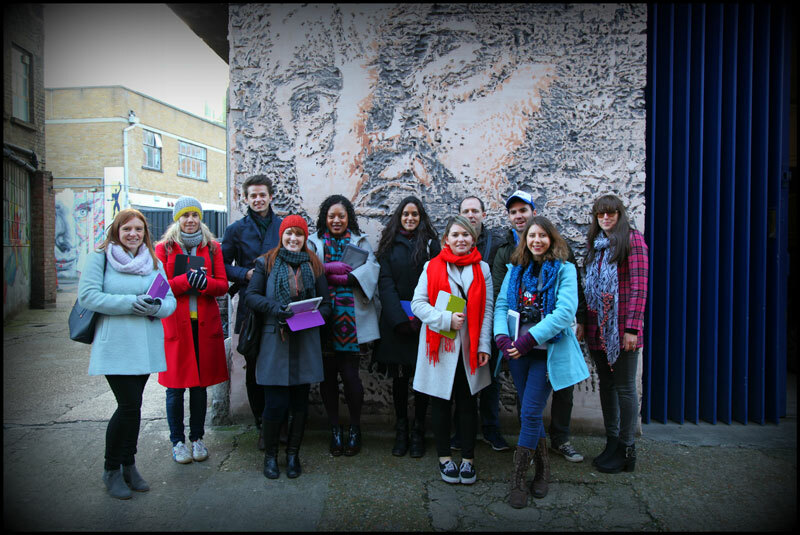 During a 2.5hr street art tour we were encouraged to take photos on our iPads as there would be prizes to be won afterwards! In this post you’ll find a selection of my favourite photos I took on the day, all taken on the iPad Air 2. Our guide for the day was Frank a.k.a. graffiti artist Steam 156 of Graffiti Kings. If you want a street art tour from an expert on the local scene, but who can also share dozens of entertaining anecdotes from his 30-year painting career, then Frank is absolutely your man! I was so intrigued by his stories – he went to NYC in the 1980s: the birthplace of contemporary graffiti and he even breakdanced early in his career! – and hope to feature an interview with him on my blog in the future. Frank also had his own competition: the first one to spot a Christiaan Nagel mushroom sculpture in the streets and shouted ‘mushroom’ would win a DVD on graffiti and street art. And so it happened that yours truly was the lucky winner and managed to bag the first prize of the day. After an inspiring tour and many artistic photos shot in the sunny streets of Shoreditch with street art both familiar and new to me, we made our way back to the hotel where the lovely Kate gave us useful tips for editing and enhancing our Instagram posts. All participants got the chance to try out the new Logitech Keys-To-Go wireless keyboard that’s compatible with all iPads through Bluetooth. It took me a second to get used to the idea of using a keyboard with an iPad, but it does make typing longer texts or special symbols much easier. When everybody finished lunch including a super tasty mozzarella salad, smoked salmon and divine brownies, it was time to announce the five winners of the Instagram competition of the day. It appeared to be my lucky day as I had won yet another prize! I could choose between the AnyAngle case or Keys-To-Go keyboard. I had my heart set on the case as it offers everything I could wish for in a cover: it’s strong, reliable and versatile. You slip the iPad in the case enabling protection on the front and back of the iPad. You can bend the front in any angle (aha, hence the name!) that fits your ideal viewing angle. During the street art tour, I kept that front cover bent and used it as a handle in order to create a secure grip of the iPad while taking photos. Unfortunately, the AnyAngle case is only compatible with the iPad Air 2 and not with older models, including the iPad 2 I have. There was a brief moment of disappointment, but that disappeared as soon as I held my cool new Keys-To-Go keyboard in my hands. It takes only a second to match the keyboard with your iPad and the keys are arranged exactly in the same way as ordinary computer keyboards. The keyboard looks slick and is super user-friendly. I find it’s very helpful when writing longer texts on the iPad. A BIG thank you to Logitech for this fantastic day, and I’m not only saying this because I won so many prizes 🙂 The amazing people from Logitech sent me a case afterwards that does match my older iPad. 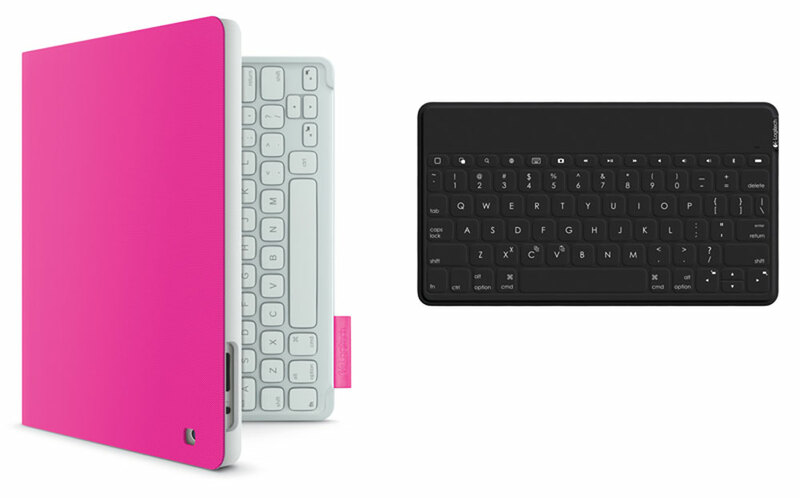 I am now the proud owner of a bright pink Keyboard Folio which comes with an integrated keyboard that connects to the iPad in a matter of seconds. Now I can decide to use my iPad as a tablet or I can transform it in a mini laptop in a minute by using the keyboard. The case provides good protection and allows the iPad to stand in an angle by invisible magnets. Also a shout-out to Brands2Life for organising the event, Kate Forster for the inspiring social media workshop and Frank for the animated street art tour. Here are the links to the blogs and websites of some of the wonderful people I met on the day: Frank’s graffiti website London Graffiti Tours, Kate’s style & fashion website Threads Styling, Russell’s food & travel blog Russell’s Kitchen, Xanthe’s beautiful photography & film website Xanthe Berkeley, Aishling’s fashion blog Le Stage, Anton’s men’s fashion, lifestyle & photography website Style Division and Danielle’s fashion blog Fashionista Barbie. My new Logitech Keyboard Folio iPad case and Keys-To-Go keyboard! Posted in street art and tagged AnyAngle case, Brands2Life, East London, graffiti, Hoxton, Hoxton Hotel, Instagram, iPad, iPad case, iPad cover, Kate Forster, Keyboard Folio, Keys-To-Go, Logitech, marketing, Mr Fahrenheit, product review, promotion, Shoreditch, Steam 156, street art, Tommy Fiendish, Whitecross Street, wireless keyboard. Bookmark the permalink. Moving up in the world comes with its own perks! Great that you are doing so well, keep us informed about your walks around London and all its interesting sights! I recently received an Ipad Air, also with separate wireless keyboard and a cover (not as fancy as yours though!) and I am very happy with it. Facetiming with my sister in France is great, skyping goes much better as well compared to my old laptop. Could never have bought it myself but my two sisters and their husbands gave these as a birthdaypresent to Jim and me. I told Robin about my sisters finding me after more than 20 years of separation and through the Ipad I can work on getting to know them again. A great gift!